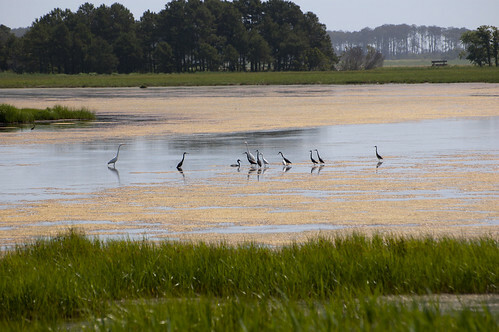 Spent the weekend with my sisters in Chincoteague, Virginia visiting the National Wildlife Refuge. Fantastic time with lots of birding (sorry Kathy). 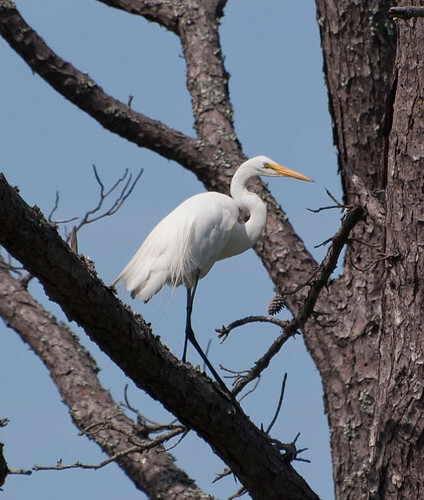 There were tons of herons (green, great blue, little blue, tricolored), egrets (snowy, great), ibises (glossy, white) and we saw some interesting behavior among them, described at the end of this post. 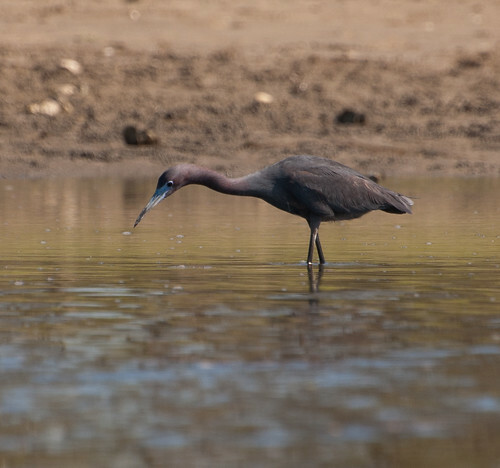 We first noted a tricolored heron that appeared to be in deeper water than usual as its wings were in the water. 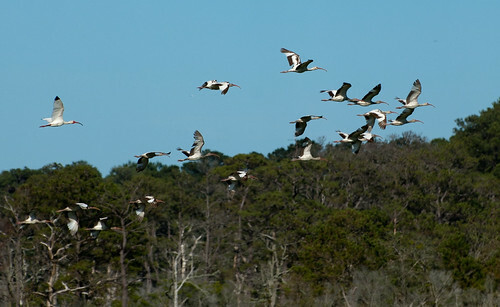 Then very quickly up to 13 other birds – various species of herons and egrets – surrounded the tricolored heron. It became obvious that the bird was not in deep water but was in some sort of distress. Turns out a snapping turtle had hold of it and was trying to drag it down under water. 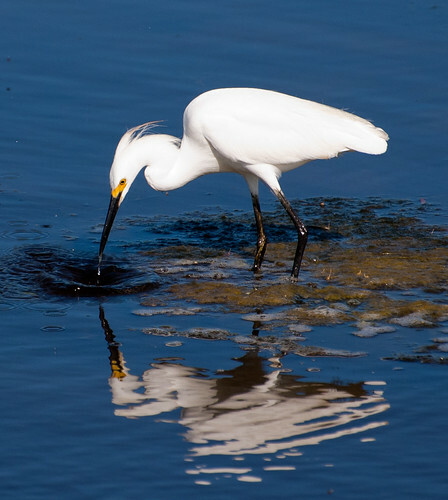 We could see the bird struggle to stay above water – “flapping” its wings in the water and pecking down at the turtle. It was fascinating to see the other birds, across species, move in. We hoped they were moving in to try to help the struggling bird and two behaviors we saw supported this. First, a great egret (the one closest to the distressed bird in the first “Birdie Funeral” photo) appeared to take a couple strikes at the turtle – we were thankful it did not appear to be aiming for the tricolored heron. Second, after about 30 minutes the turtle released the heron – not sure if it realized it bit off more than it could chew, or if it needed a breath. 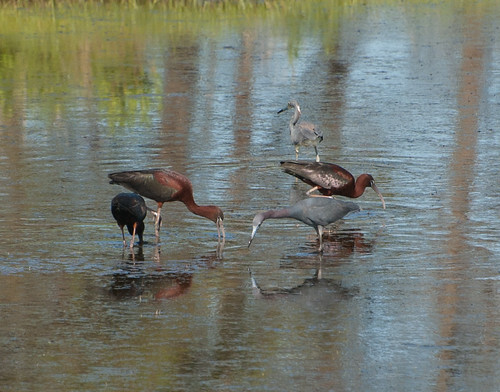 But it surfaced a few feet from the tricolored heron. 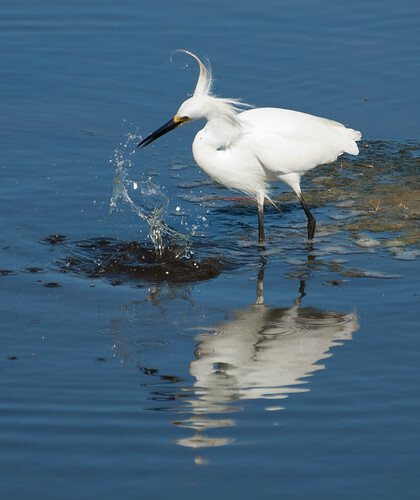 When it surfaced, a snowy egret appeared to fly at the turtle driving it underwater. The turtle would pop up a few feet away and another bird would seem to fly at it. We are not sure how this encounter ended. When we left the tricolored heron was again by itself. It was able to flap its wings above the water but did not seem able to fly away. One person I consulted on this encounter thought that the bird’s wings may have been too wet for it to immediately fly off. Hopefully its leg wasn’t too badly hurt and it was able to dry out without further attack. This entry was posted on 27 June 2013 by patacoate. 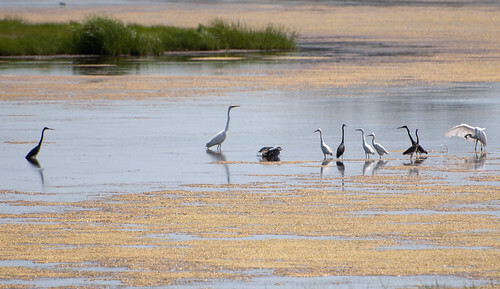 It was filed under iPhone and was tagged with Glossy Ibis, Great Egret, Heron and egret behavior, snowy egret, White Ibis.